A liquid product, Forestall™ is easy to formulate with, is completely water soluble and can be used with a variety of fragrances. It works by binding with the odor-causing molecules and removing them from the air. Its activity at low concentrations along with full solubility in water makes Forestall™ ideal for use in most air and fabric deodorizer applications. This cost-effective product provides long-lasting effectiveness against odors, creating a pleasant, fresh atmosphere. Formulation freedom, simplicity and extreme ease of handling make Forestall™ the obvious choice for superior odor neutralization. Independent tests using trained panelists assessed the effectiveness of Forestall™ as an odor neutralizer. 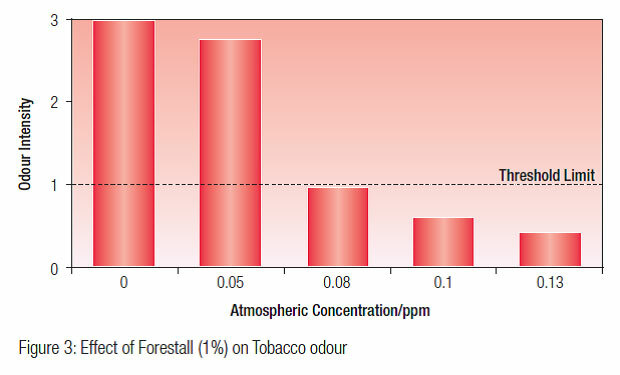 When used in formulations at only 1%, Forestall™ works rapidly and efficiently to reduce odors to a level where they can no longer be detected. 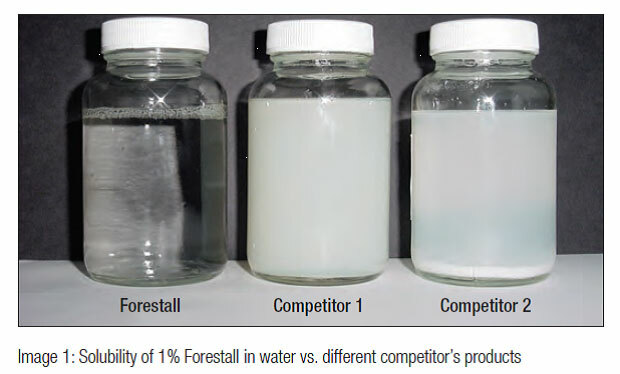 A 1% solution of Forestall™ in water gives a clear liquid. A 1% solution of a competitor’s odor neutralizer forms a precipitate or creates a hazy white liquid, requiring the addition of a solubilizer to achieve a clear solution. Forestall™ is supplied as an easy-to-use liquid and is water soluble. As a result, odor neutralizers can be produced quickly and easily without the need for heating or the addition of a solubilizer.